I didn’t know what I didn’t know about the Second Amendment. I never could have predicted many of the twists in this story of American history. I was constantly surprised at which people argued for what interpretation in each time period (Revolutionary era, constitutional conventions, federalism vs. anti-federalism, Jacksonian era, Antebellum, and post-Fourteenth Amendment era). In fact, as well written as the book is, I don’t think I still could explain the roller-coaster to someone else. I’ll be re-reading certain sections, especially the helpful summaries at the end of each chapter. My biggest takeaway from this book is that it’s no wonder that our country hasn’t solved our differences over gun rights and regulations yet–we have never really had much consensus to build upon, even over what our Constitution means. I recommend this book, not for solutions, but for historical context from which to start searching for them. 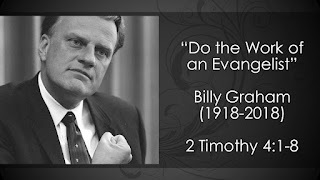 [Matt's Messages] "Do the Work of an Evangelist (Billy Graham, 1918-2018)"
It happened again. My plan all week was for us to start in on Jesus’ Sermon on the Mount with a study of the Beatitudes. We read the whole Sermon on the Mount two weeks ago, but then we took a week off to learn about the Holy Spirit after Stay Sharp. And I studied this week, thinking that we were going to dive into the Sermon on the Mount this morning. That was my plan. But apparently the Lord has a different plan for us. Because after Billy Graham died on Wednesday, I just couldn’t get him out of my mind, and when it came time to write this week’s message, I felt like it would be very appropriate to take one more week off of the Sermon on the Mount and do something special to mark Dr. Graham’s passing into glory. There aren’t very many people I would take a Sunday off my normal plan to talk about, but Billy Graham has had an enormous impact for Jesus Christ on our world. And his death truly marks the end of an era. His body will lie in state in the rotunda of the Capitol building in Washington, D.C! So Marilynn will have to come up with yet another cover about the beatitudes because this week, we’re going to stop and look at 2 Timothy 4:1-8. This is Paul’s last letter that we have. And he used that last letter (and the last chapter of his last letter!) to give his protégée Timothy a very solemn charge. And as we read it, I think we’ll hear echoes of and lessons from the life and ministry of Billy Graham. William Franklin Graham was born on November 7, 1918, four days before the Armistice was signed to end World War I. He died this last Wednesday, February 21, 2018. Over 99 years old. That’s a long lifetime. And what a life he lived! I’m not going to give a history lesson this morning. This is a sermon, not a lecture. But I recommend learning about the life of Billy Graham. When I was in college, I read this book, Billy Graham: The Authorized Biography by John Pollock. It was first published in 1966. By 1966, Billy Graham had already preached the gospel in person to over 50,000,000 people! By the time he died, it was more than twice that number. And he preached to many many more than that through broadcasting: radio, television, film, internet. He is arguably the most influential Christian figure of the last century. And everybody here knows his name. A few years from now many less will know his name. There was a time when he was on one of the top most admired people in America every single year. There are many who don’t know him today. But he has been a household name for many years. And most of us have a Billy Graham story to tell. Some way that he has impacted us. My wife's family has a picture of her grandfather, Billy Wood, standing in a group and talking with Billy Graham at the Hume Lake camp and conference center in California. When Heather was little, her parents were counselors on the floor near the podium at the Billy Graham Crusade in her hometown of Calgary. What’s your Billy Graham story? He came and preached in Altoona in 1949. I have several of his books my shelf many of which belonged to my grandmother who gave them to me when I started to show an interest in spiritual things. One on the Holy Spirit, one on the End Times called Approaching Hoofbeats. The first major paper that I wrote at college was about Billy Graham and his influence on people around the world. I put up a poster in the hallways at Moody saying, “Were you converted under the ministry of Billy Graham? I want to talk to you.” And I had several fascinating conversations of people from all walks of life who had been led to the Lord through Billy Graham’s ministry. Graham was innovative and broke new ground in publishing, broadcasting, even film making. He met with Presidents (11 of them, I think, here's a tribute from George W. Bush) and royalty and celebrities (he was friends with Johnny Cash, for example). But what he was best known for and what he wanted to be known for is for being an evangelist. A few years ago Pastor Ralph Rott gave me this book, Graham’s autobiography, Just As I Am published in 1997. In the introduction Billy writes, “I want to add a few words about my calling as an evangelist. The word evangelist comes from a Greek word meaning ‘one who announces Good News.’ Its verb form occurs over fifty times in the Greek New Testament. An evangelist, then, is like a newscaster on television or a journalist writing for a newspaper or magazine–except that the evangelist’s mission is to tell the good news of the Gospel. (The word Gospel actually means ‘Good News’). In the Bible, an evangelist is a person sent by God to announce the Gospel, the Good News; he or she has a spiritual gift that has never been withdrawn from the Church. Methods differ, but the central truth remains; an evangelist is a person who has been called and especially equipped by God to declare the Good News to those who have not yet accepted it, with the goal of challenging them to turn to Christ in repentance and faith and to follow Him in obedience to His will. The evangelist is not called to do everything in the church or in the world that God wants done. On the contrary, the calling of the evangelist is very specific. Nor is the evangelist free to change the message, any more than a newscaster is free to change the news. The main thrust of our message is centered in Christ and what He has done for us by His death and resurrection, and the need for us to respond by committing our lives to Him. It is the message that Christ came to forgive us and give us new life and hope as we turn to Him” (pgs. xiv-xv). That’s what Billy Graham was all about. And I have four points of application that I want to make. All four come from 2 Timothy chapter 4, but I want to use a catchphrase from or about Billy Graham to describe each one. When Billy Graham preached, he didn’t just spout out his opinions. He didn’t just tell stories. He didn’t just share his feelings. He preached from the Bible, and this was his catchphrase, “The Bible says...” and then he would explain biblical teaching. Because that’s where the power is. And because he was heeding the words of Paul to Timothy in chapter 4. Listen again to verse 1. Can you feel how serious Paul is about this charge? You can’t get any more serious than appealing to the presence of God and Christ who will JUDGE and is coming back again to set up His Kingdom. That’s the basis of this charge. Only the truth will save! Doesn’t verse 3 sound like today? It’s been like that for a long time. Paul warned of it, Billy Graham saw it in his day and countered it by preaching the Word. Where are you at with God’s word? Are you trusting in it? Are you reading it every day? Are you basing your life on it? You know there was a time in Billy Graham’s life when he had some serious doubts about the Bible. It was 1949 and the Los Angeles evangelistic crusade was coming up. And another preacher had challenged Graham that the Bible was out of date and couldn’t be trusted. And Billy had a little crisis of faith. He writes about it on page 139 of Just As I Am. Have you had that same experience? I remember when I read about that at Moody about 25 years ago that it was a great example to me. I got down on my knees and said something very similar to the Lord. I still have questions. But I also have faith in God’s Word. That’s why I’m up here every Sunday teaching this thing! Do you believe what the Bible says? Or do you just want teachers to say what your itching ears want to hear? Don’t turn away from the truth and turn aside to myths. The passage just before this is also very familiar. Paul just go done reminding Timothy what the Word of God is. Look up at 3:16. And whatever it says, we trust that. That’s the title of the hymn that is most closely associated with Billy Graham and his evangelistic team. By the way, that’s one of the things I love about Billy Graham is that he surrounded himself with a team. He didn’t try to do everything on his own. He was like Paul in that, too. And some of his team led the singing like Cliff Barrows and George Beverly Shea. One of the things that Billy Graham was known for was giving people an invitation right then and there to respond to the gospel message. At his stadium events, he would invite them to come forward, talk with a counselor and pray to receive Christ. Now, of course, you don’t have to walk an aisle to become a Christian. It is by grace through faith that we are saved. And not by our works at all. But we can express that faith by walking an aisle and praying a sinner’s prayer. And we must all respond in faith to the gospel to be saved. We all have to repent and believe. We all have to come to Christ. And just as we are. We don’t get cleaned up first. We come as we are, sinners without one thing going for us...except the grace of God. And it’s the job of an evangelist to tell us that gospel and call us to respond to it. Look at verse 5. Timothy was supposed to keep a level head. That’s not easy all of the time in ministry. Billy Graham did well at that on the whole, but he’d be the first to tell you that he also made big mistakes. I think it’s a mark of his integrity that he publicly declared his regrets and things he’d do over again if he could. One was that he wished he’d studied more. Another was that he’d traveled less. And was away from his family less. Another was that he had done more to effect racial reconciliation. He led the way in desegregating his evangelistic campaigns and partnering with minority preachers, but he wished that he had done more and sooner. And another big regret was that he allowed himself to get too embroiled in politics and too enamored with politicians. He says in his book, “...There have been times when I undoubtedly stepped over the line between politics and my calling as an evangelist. An evangelist is called to do one thing, and one thing only; to proclaim the gospel. Becoming involved in strictly political issues or partisan politics inevitably dilutes the evangelist’s impact and compromises his message. It is a lesson I wish I had learned earlier. About one thing I have absolutely no regrets, however, and is my commitment man years ago to accept God’s calling to serve Him as an evangelist of the Gospel of Christ” (pg 724). What Billy never regretted was sharing the gospel of grace. He never regretted doing the work of an evangelist. He never regretted calling people to respond to Jesus just as they are. I think that means that Timothy might not have the gift. He might not have that special ability that some people have to talk about Jesus and see them come to faith. Heather and I had a friend at Moody named Jeff who would go for a walk and come back with convert. He just had that gift. I don’t have that gift. But I can still do the work. I can still tell people about Jesus and invite them to respond to Him in faith. You and I will never be Billy Graham. We won’t preach to millions about Jesus. But we can share Jesus with a friend, a neighbor, a family member, a co-worker, a stranger. Have you filled out one of these yet? This is doing the work of an evangelist to be a fisher of men. Write down their name and your name. Who you are praying for and wanting to reach with the gospel of grace. See, Billy is gone now. It’s up to us pick up the baton. It’s up to us to discharge the duties of our ministries. That’s not going to be easy. That’s why Paul told Timothy to endure hardship. This being a Christian thing is not easy. 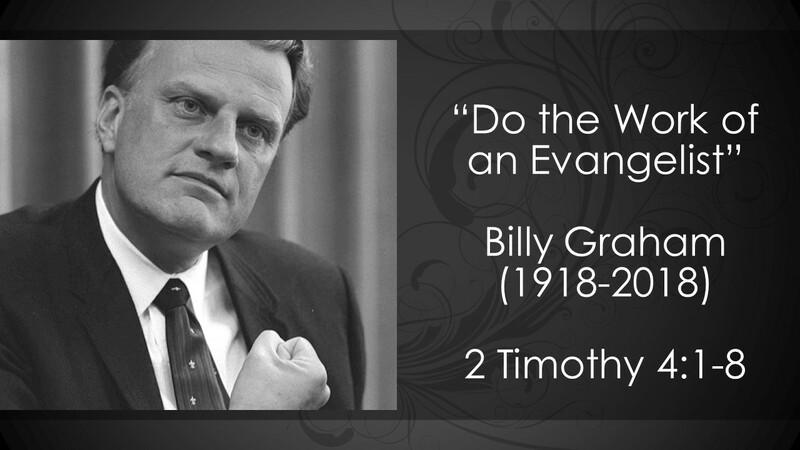 Billy Graham didn’t have it easy. He had Parkinson’s Disease. He had all kinds of threats. So many situations he got into that were difficult. Constant criticism. But he was faithful to do the work of an evangelist. And you and I can be, too. Who do you need to talk to this week about Jesus? And tell them about what Jesus did for them? And invite them to receive Him as Lord and Savior? I hope that the death of Billy Graham ushers in a new season of evangelism in the church. Because it’s so easy to not share the gospel. “You’re going to have to do it now. Billy Graham could be saying the same thing to us today. I gave you the gospel. I gave you the steps to peace with God. Now, you need to go tell others. That’s not what he called it, but it’s named after him. You might have heard it called, “The Mike Pence Rule” because our current Vice President has adopted it and taken flack for it, as well. And that is that Billy Graham would not travel with, meet with, or eat alone with a woman who was not his wife. Now, that’s not in the Bible. The Bible doesn’t give us that rule. But there is wisdom in it. What the Bible does say is that men are to be faithful to their wives. And they are to flee youthful lusts. And they are to be men of integrity. Paul is saying that he stuck with it. He is not claiming to be perfect, just persevering. He has not given up or defaulted on his confession of faith in Jesus Christ. Back in 1948, they met in Modesto California and made a list of the things that normally sink evangelists: money problems, sexual scandals, working at cross-purposes with the local church, and exaggerating evangelistic success. And they decided then and there that they would put practices in place to makes sure they did not fail in any of those areas. And to be true to their principles, no matter. The Modesto Manifesto. They stayed faithful to the wives. They were careful with the money. They worked closely with local churches. They were accurate in their reporting. They fought they good fight. They finished the face. They kept the faith. This is a call to integrity. Billy Graham was faithful to Ruth Graham. He lived out his commitment to Christ as he lived out his commitment to Ruth. Now, I don’t know what your particular practices are to be men and women of integrity, but what matters is that you are. Because there is a correlation between how we live and the gospel that we preach. Is there something you need to put in place to guard your integrity? Maybe it’s internet filter and accountability software for your phone and computer? I use something called “Covenant Eyes,” and it sends a weekly report of places I go online to my accountability partner. Billy Graham wouldn’t get into an elevator alone with a woman who was not his wife. That might be too strict for you. But he didn’t default either! He stayed true to Ruth and to the gospel and to Jesus. I’ll bet the Apostle Paul would have loved that song, too. Because that was how He felt about Jesus. Look at verse 8. All who have longed for Jesus to come back. Paul knows that he will be reward by Jesus Himself. And he looks forward to it. But the best part of that reward is the One who is giving it to him! Paul has been longing to see Him face to face. He’s lived for Jesus, more than anything. Billy Graham got lots of applause all around the world. And he’s being honored this week. But he often said that his goal was to actually hide behind the Cross so that people would not see him but Jesus. And now, Billy gets to see Jesus. On the last page of his autobiography, he wrote, “I know that soon my life will be over. I thank God for it and for all He has given me in this life. But I look forward to Heaven. I look forward to the reunion with friends and loved ones who have gone on before. I look forward to Heaven’s freedom from sorrow and pain. I also look forward to serving God in ways we can’t begin to imagine, for the Bible makes it clear that Heaven is not a place of idleness. And most of all, I look forward to seeing Christ and bowing before Him in praise and gratitude for all He has done for us, and for using me on this earth by His grace–just as I am” (pg. 729-730). I'm thankful beyond words for the life and ministry of Billy Graham. I don't have much to add to the many good words being said all over the place in his memory. Billy Graham's ministry has been an inspiration and a model. The first big paper I did in college was on the impact of his evangelism on believers around the world. I've read one really good biography of him and his autobiography, too. It's hard to overstate his influence. Check out the photo gallery for a lot of great history! Graham founded this magazine and they have wonderful coverage of his life and ministry in this special issue. "His impact on modern Global Christianity is unparalleled. And yet His life calling was one of simple obedience. 'My one purpose in life,' Rev. Graham once said, 'is to help people find a personal relationship with God, which, I believe, comes through knowing Christ.'" "While only God can rightly assess the ripple effect of a person’s life in all the ways it has influence, my own judgment would be that Billy Graham’s greatest impact is the eternal difference he made in leading countless persons, from all over the world, out of destruction into everlasting joy and love." "1. Graham has preached the gospel to more people in live audiences than anyone else in history—nearly 215 million people in more than 185 countries and territories." "'An evangelical,' George Marsden once remarked, 'is someone who likes Billy Graham.' If that is the definition, then for today at least, the whole world is evangelical." He wasn't perfect, and he'd be the first to tell you that! Much more can be and is being said. I just add my voice to the chorus of those thanking God for him today. A different angle on disicpleship. In The Imperfect Disciple, Jared Wilson re-imagines the traditional spiritual disciplines of discipleship through the lens of grace. He writes, “I want to, by God’s grace, give you the freedom to own up to your not having your act together. I wrote this book for all who are tired of being tired. I wrote this book for all who read the typical discipleship manuals and wonder who they could possibly be written for, the ones that make us feel overly burdened and overly tasked and, because of all that, overly shamed” (pg. 230). It’s not that he doesn’t encourage people to do Bible study, prayer, fellowship, confession, etc. He does. But he also shows how we do those things by grace and to access grace and how we aren’t measured at all by our performance of them. It’s not a practical how-to book but instead a very mind-orienting one. Wilson’s writing voice is fresh, honest, and funny. You can tell that he's a real person, and his humility makes him accessible. Our small group read and discussed each chapter over several weeks and came away encouraged. Recommended. My plan was to fully jump into Jesus’ Sermon on the Mount this morning. Last week, we read the whole thing from start to finish, and my plan was to start in on the beatitudes this morning. That’s why Marilynn put that cover on your bulletin. But I guess the Lord had different plans for us! I’m just not ready to take us deeply into Jesus’ sermon like I wanted to. Hopefully next week, we can do that. But that casserole needs a little more time in the oven! Instead, I want us to use this time to think together about the Holy Spirit. In fact, I have a snazzy Latin title for today’s message. 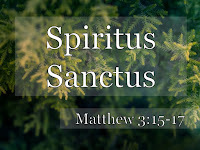 “Spiritus Sanctus” was the theme of the Stay Sharp Theology Conference that a group of us attended this week at our district church in Canonsburg. We go to hear Greg Strand from the EFCA National Office teach us about the Person and Ministry of the Holy Spirit. It was a really good conference. Great teaching on the doctrine of the Holy Spirit. A lot of people have said that learning from Greg Strand is like drinking directly out of the fire-hydrant. He just opens up and pours out good teaching, and it’s basically too much! And Greg always brings more than he can share. Greg brought a 292 page powerpoint presentation, and we probably didn’t make it through half of that during our two days together! But it’s all good. What I thought we might do today is to review together the major outline of the biblical teaching on the Person and Ministry of the Holy Spirit. 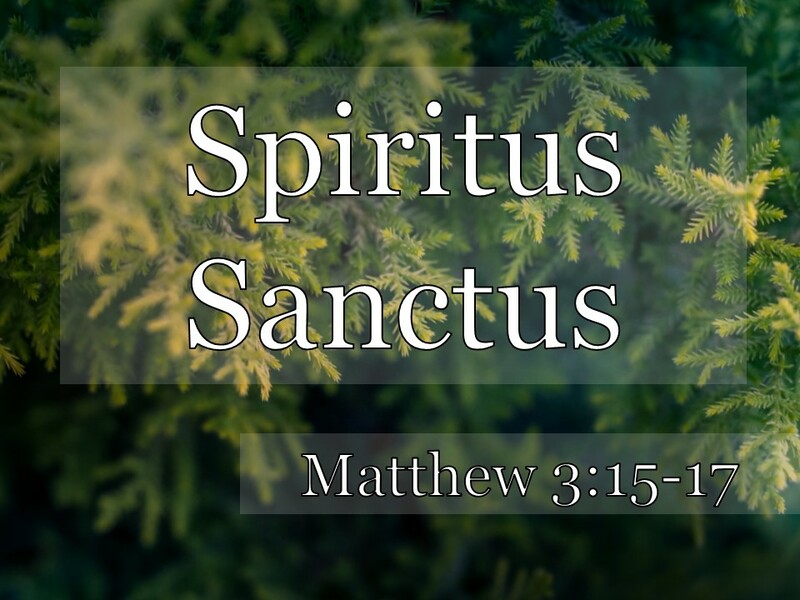 What do we mean when we say, “Spiritus Sanctus?” Who or what is the Holy Spirit? For some of us, that’s a very basic question. We’ve known about the Spirit for most of our lives. But perhaps it would be good to be reminded. For others of us here, we may never have received much teaching on the Person and Ministry of the Holy Spirit. I remember when we took the teens to the Challenge Conference in 2016. And the teaching there was about how our identity is shaped by the Trinity. God is Father, so we are a family. God is Son so we are saved servants. And God is Spirit so we are sent on mission. And the teens we had that year at Challenge said that one of things they learned the most that year was just simply who the Holy Spirit is. They didn’t know that much about Him. It reminded me of those disciples of John the Baptist that the Apostle Paul met in Ephesus in Acts 19. When Paul asked them if they had received the Holy Spirit, they said, “No, we have not even heard that there is a Holy Spirit!” (Acts 19:2). We don’t want that. Christians believe in the Holy Spirit. Greg took us through church history and showed us what Christians have believed about the Spirit (good and bad) ever since the first century. We don’t want to be ignorant about the Holy Spirit. So let’s have a little "mini-Stay Sharp" on Him this morning. And we’ll start at the baptism of Jesus. We just looked at this a few weeks ago, but let’s focus on Holy Spirit here in particular. Matthew chapter 3, starting in verse 13. #1. THE HOLY SPIRIT IS GOD. You remember the story. Jesus knew where John was baptizing by the Jordan River. He came to see John and asked to be baptized himself. John, realizing who Jesus is, God’s Son, the Messiah doesn’t want to do it. John thought that Jesus should baptize him. John knew that Jesus was greater than Him. He had just said that. In fact, he said that he wasn’t worthy to untie Jesus’ sandals, much less baptize Him! He said that Jesus would be doing the baptism and not with water but with...what? And John knew that Jesus didn’t need a baptism of repentance! We said a few weeks ago that it meant that Jesus was identifying with us in His righteousness. Baptism is identifying. It is putting yourself into someone or something–identifying with that. When we get baptized, we are publicly putting ourselves into Christ by repentance and faith. And we’re looking for the next class of people who want to do that. To go public, identifying with Jesus in baptism. When Jesus was baptized, it was going the other way. He was identifying with us. It was right; it was righteous, for Him to get baptized, too. There is so much there. We keep coming back to it. For one thing, here is the Trinity, right? You’ve got the Son being baptized. You’ve got the Father declaring His love and pleasure with the Son. And there is Somebody else there, too. Who is it? The Spirit of God, also called the Holy Spirit, descends from heaven and lands on Jesus, in some way like a dove. All three are present in one place, in one event, at one time. Father, Son, and Spirit. Notice that verse 16 calls Him the “Spirit of God.” Now, that could just mean that He belongs to God in some way. He is the Spirit that belongs to God. But other passages of Scripture clearly teach us that the Holy Spirit is fully God Himself. Lying to the Spirit is lying to God. The passages go on and on equating the Spirit of God with God Himself. When Jesus gave the great commission at the end of the Gospel of Matthew, He told His disciples to baptize in the Name (singular) of the Father and of the Son and of the Holy Spirit. We might think of that as three names. But Jesus saw them as co-eternal, co-equal, fully divine. Now, you might think that this is just a settled fact. And it is, as far as I’m concerned, and as far as church history is concerned. But there are still people who call themselves followers of Christ who do not believe that the Holy Spirit is God. The Third Person of the Trinity. I talked to two people this week who both say they believe in Jesus who are not sure that God is triune. Father, Son, and Spirit. One God in three persons. They are not sure that the Spirit is a distinct Person or fully God. Friends, this Spirit of God who descended upon Jesus at His baptism was God the Spirit. We don’t just worship God the Father. We also worship God the Son. And our worship should embrace God the Spirit because they are Three in One. When was the last time that you specifically remembered in worship that the Holy Spirit is God? I’m thankful for worship songs like Holy, Holy, Holy that bring out that truth! "God in Three Persons, Blessed Trinity." We sang songs about and to the Holy Spirit at the conference. Breathe new life into my willing soul. To renew my heart and make me whole. Give me passion for Your purity. We should worship God the Spirit. Now, we’re going to see in just a few moments that the Spirit is self-effacing and actually loves to be in the background. So, it’s not that strange that He isn’t at center stage in our worship all of the time. But it is right and proper to worship Him, because He is God! #2. THE HOLY SPIRIT IS A PERSON. We don’t get that from this passage, but when Jesus promises for the Spirit to come in John 14, that’s how Jesus refers to Him. Jesus knew that the Holy Spirit was not an IT, but a Person. Everything Greg said this week supported that idea. He showed us that the Spirit has, in some way, emotions (you can grieve Him) and intellect (He knows things), and will (He decides things). The Spirit is a Person. And that’s important because that means that we can have a relationship with Him. We Can Relate to Him. Our relationship will center on Jesus, we’ll see that again and again. But it will be fellowship with the Spirit. The Holy Spirit is not just an impersonal force. Whenever I lead an ordination council for pastors, that’s always my first question when we get to the doctrine of the Holy Spirit. Everybody ask that question at lunch today and see how many answers you can get. There are similarities. The Spirit is powerful. The Spirit is found everywhere. But other than that they are not very alike. In Star Wars, the Force, is impersonal and can be controlled by the Jedi’s. God the Spirit is not controlled! He is free to do as He pleases. He is a Person. He can be grieved, quenched, blasphemed. So we can relate to Him. We don’t tell Him what to do. But He does tell us. And He’s at work in our lives. He is so busy in our lives as Christians, and we don’t even realize it. Greg gave us a long list of His ministries. Pages and pages of notes on what He is up to in our lives. And that just scratches the surface. #3. THE HOLY SPIRIT IS MYSTERIOUS. Why does the Spirit (v.16) descend like a dove? I’m really not sure. From this point on in history, doves are a symbol of the Holy Spirit. In the 2nd verse of the Bible, the Spirit of God is pictured as “hovering” bird-like over the waters. But that’s mysterious, too. What does that mean? In fact, almost everything about the Holy Spirit is mysterious! For example, He is a Spirit! It’s supposed to conjure up the idea of wind blowing, the breath of God, the exhale of God huffing and puffing and working His power in the world. Our word “spirit” doesn’t really cut it, but there are no good words. Because we think of Casper and Slimer and walking white bedsheets. There are no perfect words to capture Him. The Spirit is too mysterious. Wind is not the only picture. Hardly! Water. Fire! Flames of Fire. Powerful Clothes. These and more are all pictures of the Holy Spirit. He’s too mysterious to capture with just a few words. And I think that means that we need to wonder at Him. We Should Wonder at Him. We should marvel at Him. Thinking about the Spirit should lead us in marveling at His amazing work. He is not a hum-drum subject worthy of scant attention. No, He is the mysterious, personal, God the Spirit–worthy of our wonder and amazement. And we should not treat Him as our pet. I think that the number one takeaway that I heard from the Stay Sharp conference this week was that we should not misuse the Holy Spirit. We shouldn’t claim things for Him that we cannot back up with Scripture. We should be careful to attribute things to the Spirit that may or may not be. For example, we should not treat Him as simply a feeling. That reduces Him to the level of our emotions. We learned about lots of movements of people over the years that have claimed the Spirit and the fruit of their actions were so far from the fruit of the Spirit, it was scary! Not that we don’t see the Spirit the working in our lives. We do. The Spirit is mysterious. And He is not controllable. He is like the wind! Anybody here able to control the wind? He is elusive. He is incomprehensible. We can know Him in part but He is also beyond our grasp. Let’s wonder at His work in our lives. #4. THE HOLY SPIRIT IS JESUS-CENTERED. One of the reasons I picked this passage to preach on the Holy Spirit, not because it is about the Holy Spirit, but because it shows the Holy Spirit in His dove-like-descending highlighting the Person and Work of the Lord Jesus Christ! Even as the Spirit operates amazingly and supernaturally and mysteriously and miraculously, He is always pointing people to Jesus. The Holy Spirit is Jesus-Centered. The Spirit is all about Jesus! Greg told us that J.I. Packer calls this The Spirit’s Floodlight Ministry. In His book, “Keeping in Step with the Spirit,” Packer writes, “I remember walking into a church one winter evening to preach on the words ‘he shall glorify me,’ seeing the building floodlit as I turned a corner, and realizing that this was exactly the illustration my message needed. When floodlighting is well done, the floodlights are so placed that you do not see them; you are not in fact supposed to see where the light is coming from; what you are meant to see is just the building on which the floodlights are trained. The intended effect is to make it visible when otherwise it would not be seen for the darkness, and to maximize its dignity by throwing all its details into relief so that you see it properly. This perfectly illustrates the Spirit’s new covenant role. He is, so to speak, the hidden floodlight shining on the Savior...[His message is] ‘Look at him, and see his glory; listen to him, and hear his word, go to him, and have life, get to know him and taste his gift of joy and peace” [Keep in Step with the Spirit, pg. 66]. Some Christians have made the mistake of ignoring the Holy Spirit. Other Christians have made the mistake of focusing too much on the Holy Spirit. But Holy Spirit want us to be Christians, not Pneumians. Not Holy Spiritists, but Followers of Jesus Christ. The Holy Spirit is Jesus-Centered, and So Should We Be. We should be Jesus-centered, too. The Spirit of God will be eternally happy if we are eternally focused on Jesus Christ! It was right for Jesus to be baptized, to identify with you and me. And when Jesus went to the Cross, He was identifying with us yet again. Jesus was taking our un-righteousness, and in the greatest exchange ever, He was giving us His perfect righteousness! And to all who put their trust in Him and what He did on the Cross, they receive the gift of the Holy Spirit (Acts 2:38). And the Holy Spirit then continually shines His light on Jesus in our lives so that He gets the glory forever. “If you picked up this book, there’s a good chance that God has enrolled you in WU [Wilderness University], though you may be reluctant to attend classes. Sometimes I find men who are afraid to admit they need a reset. They are scared of what they will find out about themselves and apprehensive about what changes will be required in their lives. When I talk to them about the adjustments they need to make, they often resist. When I tell them they have to go 20 percent slower, sleep 20 percent more, or reduce ministry service by 20 percent, what they hear is, ‘Life is over, I’m a has-been, I’m just a lazy and unfruitful servant.’ For most of them, however, doing 20 percent less simply takes them down to about 120 percent of what most normal people do with their lives! Less does not mean nothing. Some change does not mean total change” (pg. 189). And now that I’ve actually read his excellent little book about how to live a grace-paced life in a burnout culture and begun (painfully!) putting his wise counsel to work, I’m really hoping he’s right about the potential results: “And, strangely, the vast majority of them eventually tell me that life on this side of Reset garage has turned out to be even more profitable and abundant. They are doing less but accomplishing more. They have reduced their work a little, but have seen God work more. They have been to Wilderness University, but have graduated with baskets full of fruit” (pg. 189). That sounds really good, and Murray has even has walked the path ahead of us–the best kind of guide. I’ll be returning to this book again and again. My son, a budding blacksmith, loves this book, and I can see why. By providing tips on everything from workspace to tools to safety to teaching your self, Hoffman acts as a personal guide to anyone today who wants to learn this ancient art. I don't know anything about this stuff myself, but my son is quickly becoming proficient, and he says that Hoffman's self-published book is spot on. Recommended. Book Review: "Narrative of the Life of Frederick Douglass Written by Himself"
Douglass’s autobiography is hard to read and hard to put down. His commitment to minceless truth-telling of the disturbing realities of American chattel slavery makes reading it painful. It would be far easier to look away. But the writing is straightforward, clear, open-eyed. I was drawn into his story and was surprised when it was over so soon. I think everyone with an interest in American history and race relations should read it. Able, even-handed survey of the Bible’s teaching on the Holy Spirit. Graham Cole has done the Church a service by succinctly sketching out the main lines of the complex data in the Bible about the Third Person of the Trinity and ably assembling them into a coherent picture of His person and ministry. Cole’s work is a textbook example of theological method. I learned not only from what he wrote but how he wrote it. It’s careful, learned, and cheerful. He does an excellent job of providing balancing perspectives on the many controversial questions about the Holy Spirit. At times, I wished he was more decisive and less tentative about his exegetical and theological decisions, but that just shows how difficult some of the judgment calls are to make in this arena. Wherever a strong conclusion was required by the either the importance of the question or the preponderance of the biblical evidence, Cole did not hesitate to reach it or state it. If I could write a book on this level, I would want to do it on this model. I especially appreciated how Cole started with the mystery and elusiveness of the Spirit (He is the uncontrollable wind!) and ended with His divine self-effacement. The Spirit of God is perfectly worthy to be made known but is best known as He makes known the Son of God. “The magnificence of the Spirit lies in this self-effacement or divine selflessness. For this reason believers are rightly called ‘Christias’ not ‘Pneumians’” (pg. 284). Highly recommended. P.S. The glossary in the back was extremely helpful! I loved Daniel Taylor’s first Jon Mote mystery, especially getting inside the voice-filled head of the main character with all of his seemingly random yet deeply insightful (and completely hilarious!) thoughts vectoring off in all directions and leaving no allusion unturned. I also loved meeting Jon’s special and sweet sister, Judy, who, though limited and hurt in obvious ways, was also more able than most people to see things as they are really are and to trust Jesus no matter what. It wasn’t perfect (the murder mystery plot kind of fizzled), but it was deeply satisfying and thought provoking. It seemed, however, unrepeatable. Boy, I’m glad I was wrong about that! Jon Mote is back again. A little more “hinged” this time. A little more “together.” But not all the way there. You feel the whole time like he might be pulled under by the currents in his own mind. This time, there is a murder among the residents of the group home at which Judy lives and Jon works. The setting is perfect for sharp thinking about disability, personhood, dignity, and the image of God. It’s also good for guffaws and belly laughs. Taylor’s mind is very nimble! I disappeared into this book for several hours and came out with a big grin on my face. Do We Not Bleed is not for everyone. If it was a movie, it would be rated PG-13. The language is crude (though realistic for the characters depicted) and the evil is...evil. If you don’t tend to read modern murder mysteries, you might want to steer clear of this one, too. But it is also God-entranced. Not only is Jon Mote back, but Judy Mote is too, and she, as always, steals the show. I feel like I know these folks, that they are kin. And I’m hoping they visit us again. 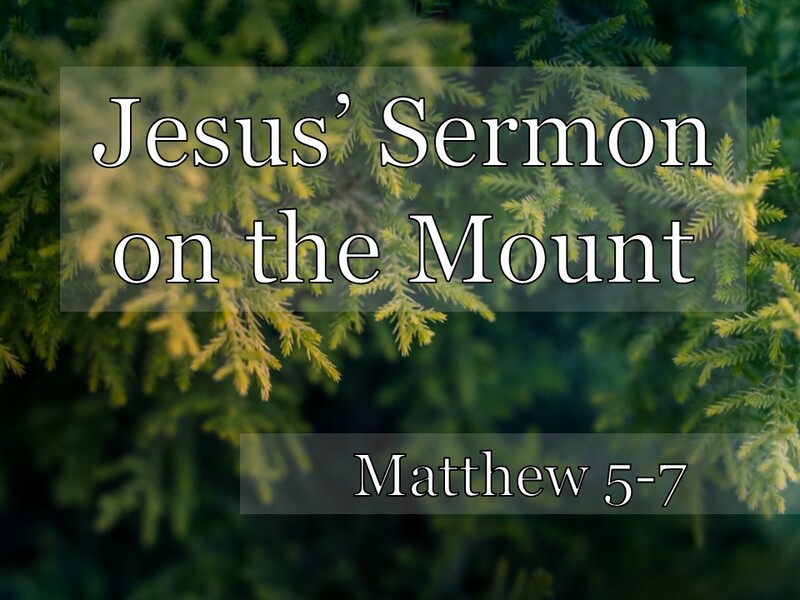 [Matt's Message] "Jesus' Sermon on the Mount"
I finally came up with a title for our sermon series on the Gospel of Matthew. It’s not especially clever, but I think it’s good and captures the essence of the book and what I’m hoping this series accomplishes in our lives this year. The Gospel of Matthew is a theological biography of the Lord Jesus Christ which invites us to follow Him by faith in all of our lives and to invite others to follow Him, too. “Following Jesus” was the title of our last message in this series. When we studied the end of chapter 4 there. The Lord Jesus began His public ministry preaching, “Repent [turn-around, do a U-turn! ], for the kingdom of heaven is near.” And He began calling disciples to follow Him. What’s our Hide-the-Word verse right now? “‘Come, follow me,’ Jesus said, ‘and I will make you fishers of men.’” Chapter 4, verse 19. Jesus is calling us to follow Him with our lives. And He is calling us to invite others to follow Him, too. That’s our mission. That’s the point of Matthew. Introducing us to Who Jesus is, the most compelling person ever to live, and calling us to follow Jesus and invite other to follow Him, too. But what does it mean to follow Him? What does Jesus want from His followers? How should we live if we belong to Jesus? Matthew chapters 5, 6, and 7 are the first and foremost of the five major blocks of Jesus’ teaching in the Gospel of Matthew. Marilynn has the first two verses printed on the front of your bulletin. And there are 3 full chapters of Jesus’ teaching them. Jesus was a master teacher. There was never a greater teacher than our Lord Jesus. And this was, perhaps, His greatest single teaching. We’re going to take several weeks, a couple months at least, to unpack it. It’s rich and powerful and radical and challenging. You know this stuff. Maybe not every verse, but this is some of the most familiar and favorite passages of holy Scripture. And we’re going to study them all in depth. And it’s going to really challenge us. Some of this stuff is really hard to live out. That might be the hardest one of all of them! This morning, I’m going to read it to you. It won’t take that long. I’m not going to stop and explain any of it. We’ve do that over the next several weeks. Today, I’m just going to read it to you. It struck me this week that Jesus delivered the whole thing at one time, and it’s really not that long in Matthew’s version. It’s about the same number of words as one of my sermons on a Sunday morning. And Who better to preach the sermon this morning, that Jesus Himself? I want to emphasize that this is JESUS’ Sermon the Mount. These are His words. If we have a problem with them, then we have a problem with Jesus. These words all come with His authority. Think about this. 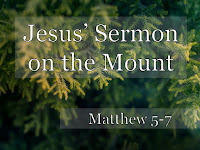 When Jesus gave the great commission and He said, “teach them to obey everything that I have commanded you,” He’s talking about the Sermon on the Mount! Among other things, of course. But this is what He commanded His disciples. And to be disciples, we need to receive this teaching. At this point in His ministry, Jesus was a rock star. There were big crowds following Him wherever He went. And verse 1 says that when he saw the crowds, he went up on a mountainside. Does that remind you of anybody? The exact same words were used of Moses in Exodus 19, 24 and 34. I think that’s on purpose. Jesus is like a New Moses. Not just giving a new law, a new Torah, a new teaching. But being a Rescuer and Redeemer. A new and greater Moses. And He sits down. That’s the position of authority in this culture. I stand to preach. But in that culture when you had authority you sat down and taught with that authority. And notice that out of the crowd, Jesus calls His disciples closer and delivers the teaching straight to them. Others are listening, but He’s talking to them about being His disciples. He’s going to talk about discipleship, and the Kingdom of Heaven (which has come near), and about righteousness, and about eternity, and fulfillment of the promises, and about how to live and how to pray. And he’s going to disagree with the religious leaders of the day. And He’s going to speak with authority. You’re going to hear a lot of things as I read this to you, but I want you to at least hear this. Listen to Who Jesus say He is and how He says it. Because the Sermon on the Mount is about how we should live as His disciples, but also why. And that’s because of Who Jesus is. These words, this sermon, is Jesus’ Sermon. And He is the Lord. So, it’s important that we listen. Jesus is Lord. And this is His Word for us today.